AQ: To Date AQ available in 10 Languages! Having a program in your own language can make all the difference in the world to a user. Their ability to take advantage of all the bells and whistles of a program is enhanced and improved 100%. While this is the ideal for all, it is also a daunting task when you consider how many different languages there are in the whole world. Individuals who write programs for different software have their work cut our for them in this regard. If per chance you are able to help with this initiative, please send us an email with the subject line of "Willing to Translate" and we will work with you to achieve another language translation! The cycle of life requires us to keep many things updated along with ourselves. Seems like every day some application on my smart phone is needing to to updated and so it makes perfect sense that software and hardware would also need to be updated. Notices that something is outdated can sometimes be accomplished with just a few clicks, while others require one to download, run and re-start their computer, one just never knows. Additionally, individuals find it is time to replace an old computer with a much improved one. So what happens to all the programs and applications on your old computer? They actually will need to be reinstalled and/or transferred. While there are programs to help this out, it does take a lot of time. Also some programs many not work on the new computer so one has to sure to have a back up plan when that happens. How does Ancestral Quest handle these things? Note that you can re-download whatever version you along with the "Adam" sample database and a "Scrapbook Sample Database". Know that you'll have to be careful with different versions as only certain ones will work on the new computers. When you click on the "Re-download your Ancestral Quest installer", it takes you to where you can choose the version you have, be sure to read the "System Requirements" so that you have the version that will work with your new computer. 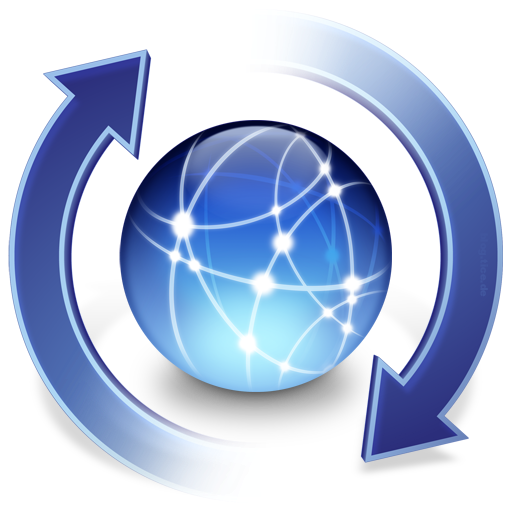 If it turns out that your current version will not work with your new computer, you will have to upgrade, but this will happen to other programs on your older computer as each program has its unique requirements and was built for a specific operating system. Know that AQ is always striving to stay up-to-date with its software and operating systems. Here is the link for the downloads page and the upgrade page if it turns out you need to update. Locating family members, documentation and connections are some of the main activities genealogists and family historians spend a good majority of their time to conduct research. There are many ways to conduct research today, online, a library, an achive, and of course through family interviews. Today we will review the help aids with online research provided within Ancestral Quest. 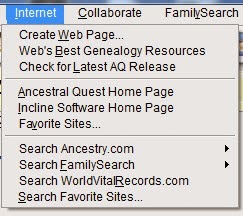 With the checkmark next to 'Ancestry.com Links' you will be able to click straight through for the highlighted individual. 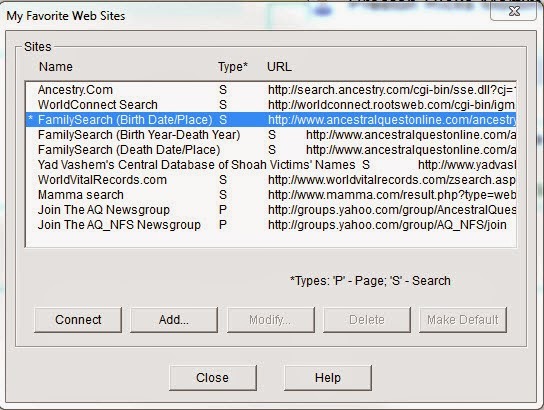 Notice that this is another way to link to Ancestry.com but also FamilySearch, World Vital Records and 'Favorite Sites'. Notice the various buttons that allow you to work in this screen. The second entry 'Search Favorite Sites', You will be brought to this Search a Web Site screen when you select an Internet site that is searchable. If you were brought to this screen another way, the site will have already been selected, so all you need do is select a person to search for (you can change the selected site if you wish). The person highlighted on the main view will be the default person to search for. You can change this by pushing the change button. 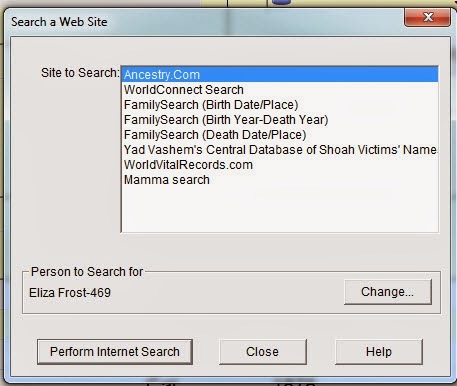 When you have the proper site and person selected, press the Perform Internet Search button to activate the search. Hopefully learning about these search features within Ancestral Quest will aid you in your own research!